Yesterday I had the pleasure of photographing Adam and Becky’s beautiful autumnal wedding at Trevenna Barns in St Neot, Cornwall. Autumn is one of my favourite times of the year and yesterday was just perfect, it was warm in the afternoon sun with an accompanying cool breeze and there were brown fallen leaves all around. Adam and Becky took their vows in the Garden Room which was beautifully decorated with splashes of bright colour to match the season. After the wedding ceremony Adam, Becky and their guests enjoyed mulled wine and canapes outside in the grounds of the barns followed by a buffet style wedding feast back in the Garden Room, which was decorated to match the season with pumpkin centre pieces on the tables. 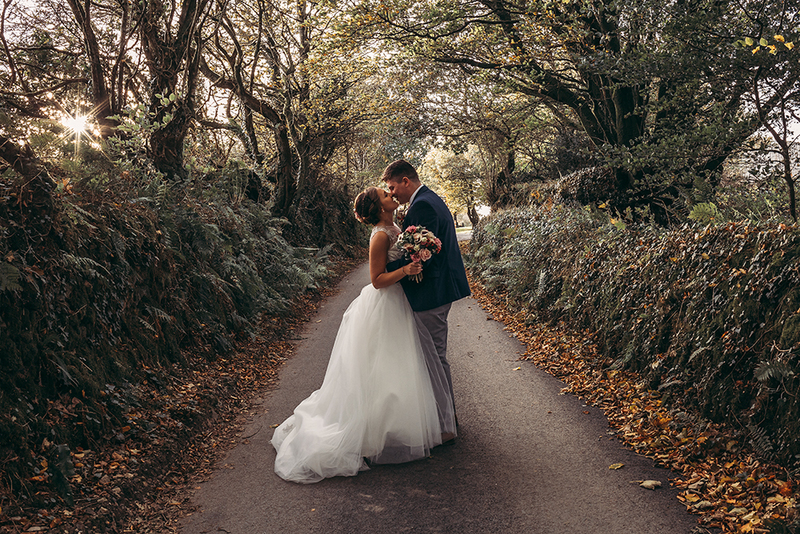 This preview picture was taken in the lane leading down to Trevenna Barns and shows the happy couple enjoying an intimate moment with the low afternoon sunshine shining through the trees. To view a full set of highlights from this wedding, please click here. If you are getting married soon and are looking for a Cornwall wedding photographer to capture your special day, please get in touch. I would love to hear from you.